Hello from a perfect summer on the island of Malta. Bright sun , soft breeze and fresh sea! 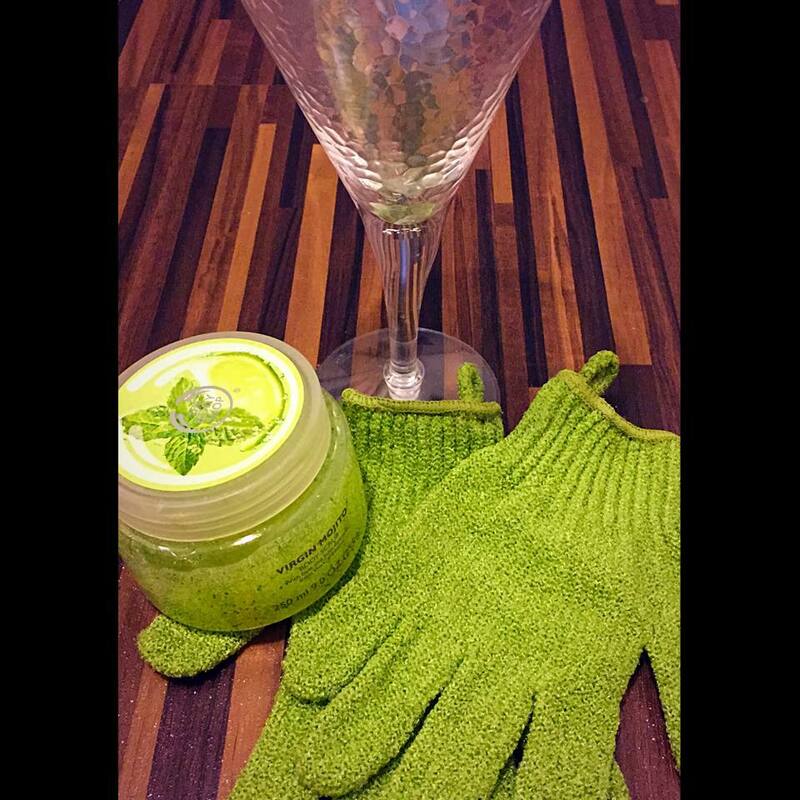 The Body Shop Virgin Mojito Body Scub was bought while on a very strict diet and I was not even allowing myself a cocktail when going out with friends. You may ask “this is a body scrub what are you saying ?”. Well at first glance the product colour is a favourite of mine so that attracted me primarily and its a fun vibrant lime which screams SUMMER. Then I checked out the tester. That is where you are transported to a cocktail bar! Smells spot on like a mojito! Not slightly; but completely 100% mojito! Once you smell it you just want to taste it or run to get yourself a cocktail so I just went ahead and purchased it together with the scrub gloves. Does it do the job though? The texture is gel like with particles of green granules. I first wet my skin with warm water, wear my gloves and get a generous amount of scrub on each hand and start the scrubbing process from my neck down. In circular motions I start cleansing my skin. As I am very pale, immediately I can see a subtle redness on my skin after finishing a section . It does not feel harsh at all which is good, but you can feel the difference on the skin surface almost right away. Once done I rinse with water only. My skin feels and looks smooth and it also smells of fresh lime! I put on a summer dress and I felt fantastic, as my skin felt so radiant in the sun.